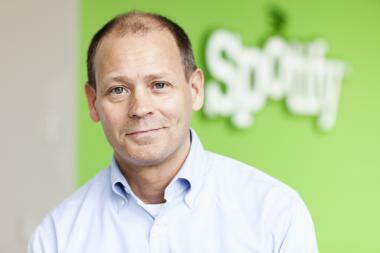 Spotify's chief content officer, Ken Parks, announced the new office in a press conference with Mayor Michael Bloomberg. CHELSEA — Music streaming giant Spotify plans to open a new American headquarters in Chelsea in September, establishing the tech company in a permanent home on Sixth Avenue. In a press conference with Mayor Michael Bloomberg on Thursday, Spotify announced that it will add 130 engineers to its New York office by the end of 2014, bringing its engineering workforce to a total of 200 in the city. The office will be the company's largest outside of its Stockholm headquarters. "Spotify's decision to expand and grow here in New York City along with its plan to hire 130 engineers underscores the reasons why we've made such a strong push to increase the ability for students to study science, technology, engineering and mathematics," said Bloomberg in a statement. The New York team will work on creating original content, developing Spotify radio stations, web development, and advertising for the service. “New York City is the engineering hub of our U.S. operations and we fully support Mayor Bloomberg's efforts to bring more technology and engineering talent to the city,” said Ken Parks, Spotify's chief content officer. Bloomberg himself heartily embraced the streaming service, showing off his office's new Spotify account, nycmayorsoffice, which features a playlist chock-full of New York-themed songs by the Beastie Boys, the Avett Brothers and Leonard Cohen.